There was a boulder we had to climb, however, our magical flight was still in effect and we surpassed that issue with ease. Once we pass there was another fork in the tunnel and I blocked off one passage with a Carpet of Adhesion spell and were set upon by undead mummies and many animated dead in their wake. 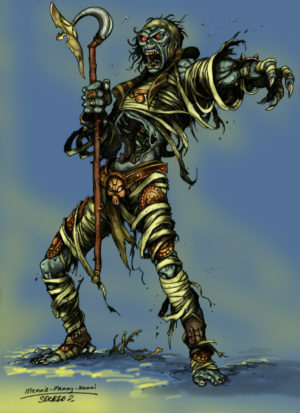 Master Ja’Deir went ‘All or Nothing’ on a wild strike and slipped between the bandages of the mummy slicing it in half! The lightning from the Lawbringer’s Thighbone appeared ineffective and then Ja’Deir realized we were facing two Mummy Immortalus creations! The second one dropped a Carpet of Adhesion spell of his own on US!! Master Tyvernos was able to drop enough lightning down onto the second one that the gaps in the banadages were enough to send it to permanent death! Master Asher brandished his holy dagger he called Ra’s Will and banished ALL of the supporting walking dead behind the Mummy Immortalus, except one. Which turned out to be a third of these creatures and so battle continues! Seriously we must both know by now I am incapable of writing a short version. I do hope my attempt at hooman humor is passable. We made it through the Mummy Immortalus through the efforts of one Otto the Bold, and his tearing the bandages so the fiends could be put to final rest. It was taken him time but Master Tyvernos’s faithful companion and purported avatar of Benevolent Bennu has shown a righteous fury unmistakable from scriptures I have read of the Goddess of Light! Creatures that have slain lesser folk to wear the mantle of hero have fallen to the fate of our little dog Otto’s maw! May he please be remembered as a loyal friend the gigantic hearted Gnomish warlock. Forward did our brave friend lead us to the battle just waiting to whittle us down behind the fell beasts best left in the dirt! Powerful is the Tezcat Necromancer that can bring Goblins, his fellow tribesmen, and skeletons to bear in a cohesive group against his foes! 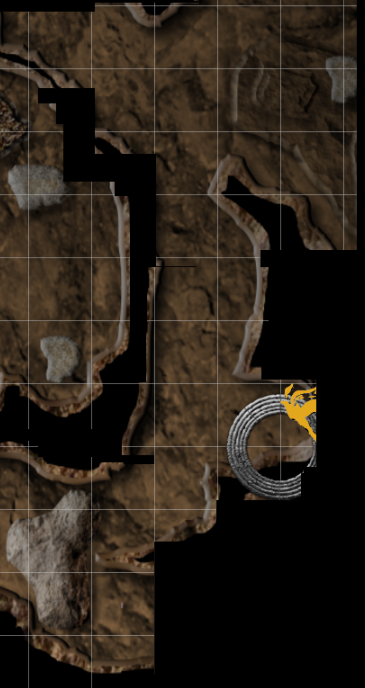 Alas, I found my rage boiling and knew how many days we slaughtered over 200 various undead to make it to the caves, and I daresay we are pushing 300 getting through them. With a burning desire to push this dark weaver of the arcane arts to his oblivion I knew I had to conserve my magic as much as possible. So I charged the group alongside our valiant, bold dog and my companions, including ‘THE MOST DANGEROUS MAN IN THE WORLD‘ firing his bolts of doom! Often from behind me and thru my the “A” frame gap in my legs! Never have I been so excited to be wearing mologoth hide leggings although he may be the source of a new rumor that Minotaurs piss lightning! Cyclops Beware!!!!!! HA! I do not care where you hail from I made a funny! I finished off this little tezcat dark weaver with a swat from the Lawbringer’s Thighbone sending him to Hades. 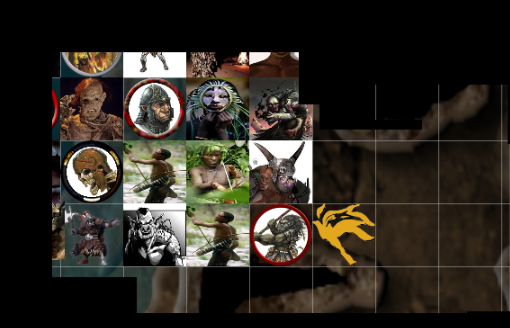 My companions finished the skeletons and other goblins with blow-darts, likely poisoned. Foul little beasts! Only to find out Master Overkill had been slain for the fifth time! Master Ja’Deir was calling us to fall back and deal with this – again! Having been slain by a Giant and Gromek on separate occasions I had no desire to try and see the afterlife a third time! He almost makes me think his ancestors were necromancers because of how often he dies and comes back! During this time the caves have been rumbling and loose stone less than my fist in size would occasionally fall to the floor. During our encounter Master Asher created a ‘circle of concealment‘ in an alcove that we might fall back and rest to regain the magic enabled strength we have come to rely upon. It was nearly as I entered they had brought our dearly departed Captain back from the land of the dead!! Soon foot steps, a LOT of them were heard coming our way and not tenth of a hourglass’s sand had passed when a few hundred Tezcat’s ran pass with victims in cages! I was working out how to track and go after them in my head, but wiser counsel was given about simply leading us to slaughter. I acknowledged internally my folly and said that I could not disagree with what had been said. It would appear even at my height shoulders slumping in defeat of doing what I believed to be the right thing could be seen by all. 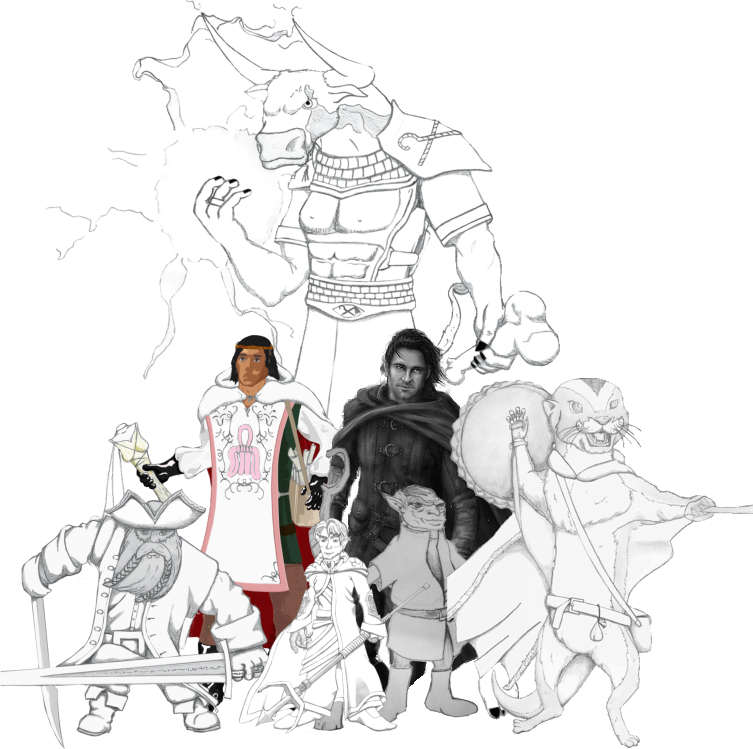 Many of them made mention of attacking them when strength was ours once more. I told everyone to rest and Jidian set to the first watch. Two hours in we were woken by the cave shaking and rumbling further, and word laden I may be but here I shall brevity. A Gnome, A Kobld, and a Dwarf walk into a cave. Two think it will last and one thinks it will collapse. We end up resting another hour before many of the Tezcats that came in with sacrificial victims run out again. I am as guilty as my fellows of indecision because I was worried about burying everyone in a collapsed tunnel and getting Master Overkill killed a sixth time! We opted to use my manacle belt for everyone to hold on two and I turned everyone ‘invisible‘ and number who people were because I couldn’t see them directly, and then cast ‘Sense magic‘ to track my own spells. Master Tyvernos had granted us the power of flight so we moved on by flying through the tunnels almost twice my height! As we passed over a group of vampires that could see us all I cast Carpet of Adhesion to prevent there following us! As we passed over a pool of blood which may have been the source of the stream I didn’t want to think about the number of victims that had died to create such a horrific body of liquid! 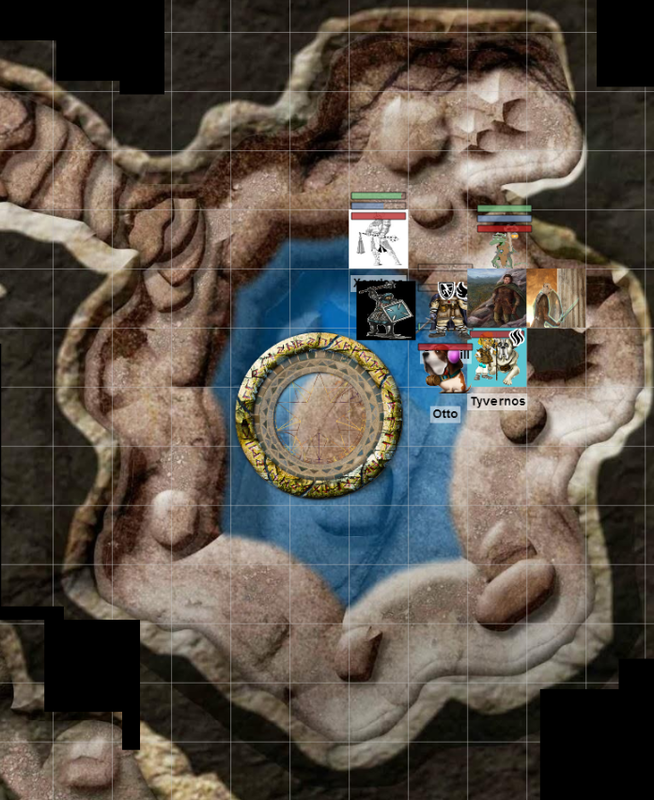 Three fourths of the way across something knocked out the active spells and we crashed onto the shoreline in front of four more Tezcats! This was a battle I was not as involved in as before and after and CrIsis stepped up and smashed the evildoers! 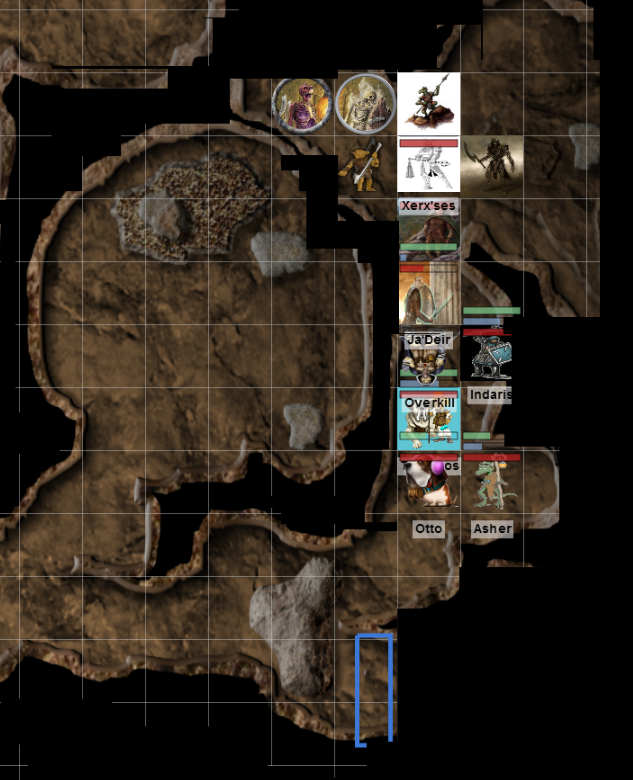 Okay Hooman humor again – A Gnome, A Kobld, and a Dwarf walk into a cave and this time find a secret staircase leading the direction the Divine Index Finger was pointing! Emboldened and onward went to face such evil now soaked in the blood of innocent victims!!! 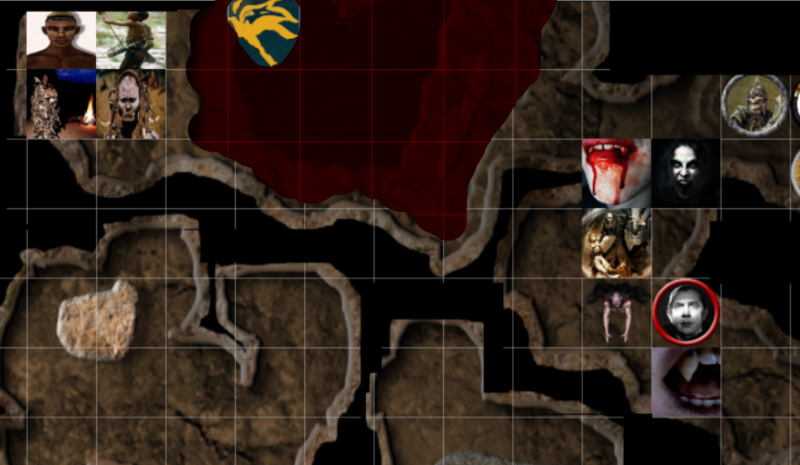 Another pool of blood, another 50 bad guys/villians, tiny little scum stood between us and our quarry! Masters Asher & Ja’Deir had blood was like water which is why standing in blood or water would be bad!!! Knowing these people were between and another piece of a good and noble god needing his ladywife plus any sacrificial victims that might be alive we arrayed ourselves and the warriors unleashed Hades as Jidian and I dropped lightning down upon the blood helping to brunt them alive making there passage to Hades climate controlled! Those that tried to climb out were met with a swift death and those that couldn’t added there fluids to the boiling, crimson torrent of overheated death! Across the way we finally saw him, the Tezcat Necromancer! There were still two sacrifices left alive and a number of his dwindling remaining henchmen. Our approach was stymied by a barrier of unknown determination. It was either I cast a spell that would stop all magic or Brother Indaris could ask for the great miracle to control all magic!!! We started both at the same time and whomever finished first would cast. I will admit I waited two seconds before starting the incantation hoping that if the gods would grant his request, which he can’t use again this decade if I understand it right! That I would be able to use a ‘Death‘ spell to finish off the Necromancer’s cronies and him! Emboldened by a ‘Fleet Feet‘ spell I was at the ready. Then the GREAT GODS OF LIGHT SAID YES!!!!!! When the good brother stood from the shallow two feet of blood we were stand in his eyes shown with the *fury of the sun* and the wave of his hand broke the spell completely! Master Asher used ‘Cloud of Slumber‘ on one group and I changed spells before summoning the energy and began phrasing the ancient Dwarven Arcane word for ‘Death‘. The rest of the group began tearing into the other group of cronies as I finished the word for ‘Death‘ and dropped a Tezcat chanter trying to work a ritual of summoning something! Amid the flashes of torchlight, spellfire, and the rumbling cave I came waving the pale enchanted hand of death. All manner of vampire, and Tezcat fell before my uttered speech of the great beyond and one that had been silence by the ‘Cloud of Slumber‘ did suffer the heel of my blood soaked boot crushing his skull! Master Asher using Ra’s Will and Brother Indaris using the Three Sisters of Dawn, began to purge the room of demons and undead! Then Master Overkill and into an inky, black magical darkness erected by the Necromancer after he had used the Lawgiver’s Right Hand to choke Master Ja’Deir from afar! By the time Brother Indaris was made aware of the darkened area of magical shadow his eyes of solar radiance flared and he swished the dark power away with a swish of his hand!! While Master Overkill had taken another necro tezcat with him our villain was still at large and the great Dwarf was slain again! Leveling the word for ‘Death‘ at the villain to weaken him others began attacking as well and working through the last of his defenses. When he tried to use the ‘Hand’ to choke another calling out for Yin-Sloth the Terrible to save him. I raised the Lawbringer’s Thighbone overhead and brought it down on the necromancer screaming, “GIVE IT BACK! IT’S NOT YOURS!” I watched his neck collapse and he crumpled to the ground!!! I dropped on top of him and ripped the ‘Hand’ off and handed it to Master Asher. Then I violently removed his head, arms and legs from his torso and used ‘fire bolt‘ to burn him and make sure he could not come back to life or un-life! While still under the great miracle of the gods the good Brother tried and we all offered something to sacrifice as an offering to help plead for our friend’s life! WE ARE BLESSED BY THE GODS FOR THE DWARF IS ON HIS SEVENTH LIFE!!! I know it is the Gods of Light that have kept summoning us by our true names from happening! I know they see us gathering the pieces and know we will not give up and we will not fail to return Osiris the Lawgiver to the worlds! Once that happens I may wish to rest, my anger spent, but until then we NEED TO FIND THE DWARF A NEW HOBBY!!! I was afraid to hug him I might send him back to Utu and check on the chess game they seem to be having! We brought the two remaining sacrificial victims with us back to the cave where we found the Elven Necromancer that had also used ‘circle magic‘ to aid her back in the 1st Part of the Right Hand of Osiris. We are taking turns tending to them and will be making our way back to Mishala now. My awesome little buddy stretched for his grand power of air and found us the time of day so we know what we are getting into on the journey back. Till the morrow rest is now needed for all. Ondemeira by our own AZ Rune. Flaming Dog by Aim 4 Beauty. Jidian/Asher picture by Jackie Ocean and Gaitkeeper.